The Amazing Race eliminated Trevor Wadleigh and Chris Marchant during the sixth episode of the CBS reality competition's 30th season on Wednesday night. The "Dating Couple and Musicians" became the fifth team eliminated from the around-the-world competition after arriving at the sixth leg's Pit Stop at Letenske Park in Prague, Czech Republic, in last place. "If we have to go out, I'd rather it be because of a U-Turn instead of something that we did terribly wrong," Chris said following his team's ouster, referencing how Cody Nickson and Jessica Graf had U-Turned them during the leg and therefore forced them to complete both sides of the Detour. "We gave it our best efforts despite what was thrown at us, and I'm just so grateful we had the opportunity to do this together. How often do you get to run around the world with your friend?" The episode began with the teams ripping open their first clue and learning they must book seats on a flight to Prague, Czech Republic, using the Travelocity mobile app. The teams also discovered a Double U-Turn was ahead in this leg. "Dating Couple and Lifeguards" Lucas Bocanegra and Brittany Austin, who had just gotten engaged, departed the Pit Stop in Les Baux, France in first place at 4:34PM. On their heels were "Retired Professional Skiers and Friends" Kristi Leskinen and Jen Hudak, who left at 4:43PM. "Twin Brothers and Firefighters" Eric Guiffreda and Daniel Guiffreda began the leg in third place at 4:52PM, and "Dating Couple and Yale Debating Teammates" Henry Zhang and Evan Lynyak departed at 4:58PM. "Friends and IndyCar Drivers" Alex Rossi and Conor Daly departed France at 5PM, and then they were followed by "Dating Couple and former Big Brother Houseguests" Jessica and Cody at 5:09PM and then Trevor and Chris at 5:43PM. The teams all managed to get on two flights to Prague. The first flight, which would land at 10AM, contained Henry and Evan, Eric and Daniel, Lucas and Brittany, and Kristi and Jen. The second flight, which was scheduled to arrive at 11AM in Prague, carried Alex and Conor, Jessica and Cody, and Trevor and Chris. Kristi and Jen made it to the U-Turn board in first place, but they decided not to take advantage of the opportunity. Lucas and Brittany chose to do the same, as did Eric and Daniel behind them. Once Henry and Evan arrived, they also opted out of U-Turning another team, and Alex and Conor did the same. However, once Jessica and Cody made it to the board in sixth place, they realized they were fighting to avoid last place. So in order to save themselves, the Big Brother team decided to U-Turn the team they knew was behind them -- Trevor and Chris. Trevor and Chris eventually made it to the U-Turn board and didn't seem surprised to see their faces. 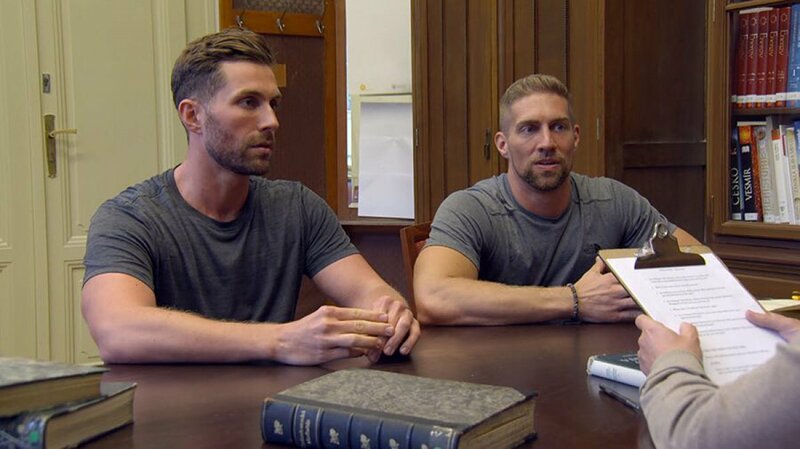 Trevor and Chris understood that The Amazing Race is a game, and they weren't mad at Jessica and Cody. But the guys acknowledged they needed to work really hard to stay in the Race, and the U-Turn seemed to light a fire under them. It then became time for the teams to complete one of two possible Detour tasks: "This" or "That." The pairs received no further instruction or hints. "This" required the teams to restack empty kegs and search among dozens for a full keg of beer. The teams then had to tap the keg and make a perfect pour into a mug with the right amount of foam on the top. Once the mugs were approved by "the brew master," the teams had to run the keg through the streets to a riverbank, where a party boat and its captain were awaiting the beer. "That" required the teams to listen to two astronomical lectures: one stating the earth is flat and the other arguing the earth is round. Teams had to pay attention to the facts -- including figures, number and details -- in order to pass a subsequent oral exam and receive their next clue. Kristi and Jen were happy to have kept their same taxi driver while Henry and Evan took off for the subway. Kristi and Jen, who were in first place at this point, opted to do the keg task. In second place was Lucas and Brittany, who chose to listen to the lectures. Henry and Evan chose the keg task in third place, along with the fourth-place team Eric and Daniel and the fifth-place team Alex and Conor. When they were in sixth place, Trevor and Chris -- who had to do both Detours -- tried the lecture one first. And in last place, Jessica and Cody chose to take on the kegs. But once Lucas and Brittany listened to one lecture -- and Lucas basically fell asleep -- the couple decided it would be best to switch tasks immediately. Brittany didn't think either of them were in the position to retain any information, and she called the task "ridiculous." Eric and Daniel really struggled with the exam but took their time with it, so they finally aced the exam on their ninth attempt. Meanwhile, Kristi and Jen and Lucas and Daniel got lost trying to find the party boat when they were running around with their kegs. Lucas and Brittany searched for the party boat for one hour and three minutes. After showing a lot of patience and composure, Eric and Daniel completed the Detour in first place. Kristi and Jen finished in second place and they were followed by Henry and Evan. Trevor and Chris proved to be quite intelligent men, as they completed the lecture Detour on their second attempt in fourth place; however, they had to go back and complete the keg task as well. Alex and Conor then finished the Detour, and on their heels were Lucas and Brittany and then Cody and Jessica. Trevor and Chris seemed to get through the keg task quickly and efficiently, but they were still in last place once they completed it -- as was expected. The teams were then instructed to head to a nearby beer spa where local patrons were bathing in beer. Kristi and Jen picked up their clue at the spa in first place. They were then followed by Eric and Daniel, Henry and Evan, Lucas and Brittany, Cody and Jessica, Alex and Conor, and finally Trevor and Chris. The teams were then told to proceed to Stara Cistirna Odpadnich Vod and search outside for their next clue. Kristi and Jen, maintaining their lead, got their first. They were then followed by Eric and Daniel, Henry and Evan, Cody and Jessica, Alex and Conor, Lucas and Brittany, and Trevor and Chris. It then became time for one member from each team to attempt a Roadblock task. For the Roadblock, the participating Racers had to stand in a room filled with what appeared to be hundreds of ringing phones. The Racers had to pick up one phone at a time and listen for someone else on the other end of the line. People were on a total of eight phones, and then it was the Racers' job to put the eight words together to make a sentence that turned out to be a famous quote about how life comes to a stop. Kristi opted to take on the Roadblock task on behalf of her team, and she was soon joined by Daniel, Evan, Jessica, Alex, Brittany, and Trevor. Evan and Daniel worked together and the result was fantastic. Later on, Jessica attempted to work with Brittany, but Brittany wasn't sure if she could trust the girl based on what previously happened with her gnome during a Roadblock task. In the end, Jessica figured out the famous quote first, but she gave Alex and Brittany a couple of wrong words so they couldn't complete the task before her. Once Jessica was ready to run out of the loud room, she gave Alex and Brittany the correct words. Alex and Brittany were a little frustrated with Jessica, but at the same time, they seemed to understand the Racer's reasoning for being dishonest. Brittany just determined she couldn't trust Jessica going forward. Kristi and Jen finished the Roadblock task in first place, and they were followed by Eric and Daniel, Henry and Evan, Cody and Jessica, Alex and Conor, Lucas and Brittany, and Trevor and Chris. The teams' next set of clues sent them to Letenske Park, which overlooks a river that gently weaves its way throughout the city. The park served as the Pit Stop for this leg of the Race, and it's where host Phil Keoghan was waiting. Cody and Jessica had trouble hailing a cab, while Trevor and Chris opted to take the subway and then a taxi. At one point, Alex and Conor saw Cody and Jessica drive by them. Cody and Jessica thought the guys were lost, but it was actually they who were heading in the wrong direction. Kristi and Jen stepped on the Pit Stop mat in first place and won a trip for two to Western Australia. Out of the six legs so far, the women finished in the Top 3 each time. Eric and Daniel claimed second place, and then Henry and Evan arrived in third place. Alex and Conor finished the leg in fourth place, and behind them were Lucas and Brittany in fifth place and then Jessica and Cody in sixth place. "We're just trying to claw our way back to the top and make sure we're not in this position anymore," Jessica told Phil. Seemingly minutes later, Trevor and Chris made it to the Pit Stop in seventh -- and last -- place, and the guys kept smiles on their faces.